I love the holidays. Yes, dear, that's LOVE. The lights and other decos, all the celebrations, the occasional glimpses of humanity in people I would never otherwise have believed possessed such a thing ... these are what help make easing into that December to April time frame we call WINTER even remotely tolerable. And of course all the Yorkie cards. What's better than photos of a bunch of unrealistically cute little dogs on the mantle?! Oh, honey, I feel your pain. I'm not much filled with the spirit this year but remember, this too shall pass. On the plus side? We all have an iron-clad excuse to EAT LIKE PIGS. And with that in mind, please send one ton of marizpan my way STAT. Thank you!!!!! Yeah, I have to say that I do love the holidays. However, my husbands mother died on Christmas day several years back- so I know how it feels to have it me a painful time as well. Now it's bittersweet. We miss her, but also totally get into the christmas movies and cookies and stuff. And by the way- I freakin love marzipan and nobody ever makes it. Like EVAR. Thank you for doing so. they are lovely and I want to eat my computer screen. You have my permission to buy totally useless gifts for those in the office. One of the best guys I know bought someone a gift certificate for one 2X4 from the hardware store. Listening to his story about trying to purchase the GC for the precise amount was hysterical! Finally, a soul brave enough to say "bah, humbug" in multiple paragraphs, bringing tidings of her own personal kind of joy to the world! The best part of Christmas is the first week in January...even in Minnesota. I embrace and applaud your Grinchness and proudly stand beside you! These are darling. And they look fairly easy, fairly. May have to try these as my Mom loves Marzipan. I am so-so on the holidays. I think its overly stressful and too commercial. I'm so sorry you lost your Mom so young. Freaking adorable marizpan candy! You know, I can take or leave Christmas. I guess it depends on what I have going on during the end of the year. If I am really busy with work or school it becomes just another day. 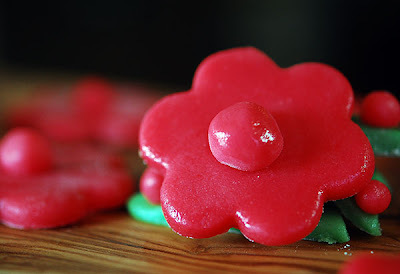 But kudos for being honest and sharing this awesome candy recipe! Sorry to hear this isn't a great time of year for you, you certainly have reason enough. I'm pretty stressed and could do with at least another week between me and the dreaded day, it was so much easier when I was younger and just wanted Barbie dolls! That marzipan not only looks gorgeous (love the colours) it looks damn impressive too! first of all, i'm totally gonna start handing out blank gift cards to people i don't like. what a great idea. I'm with you on this. Hate the holidays. No, that's not too strong a word. Hang in there. I'd start making naughty marzipan shapes just to amuse yourself. Can't hurt. You'd HATE me! I *love* the holidays. Your marzipan is positively precious!!!! I love marzipan! I hate the holidays! I could so "holiday" with you, girl. Great pictures. You are a true artist Ann. : ) I can just tell that everything you do is done with such mindfulness and care. I'm sorry that Christmas holds a painful memory for you. The holidays do evoke some degree of lamenting for most people I think. Those are so cute, but I can't stand marzipan! And I only like Xmas when everything is done, all the shopping, wrapping etc. We haven't even got our tree up yet. Honestly I've never tried these, but I like almond so I'm thinking I must be missing out on greatness. They're really cute. I like the holidays, but hate all the stress; I think it is the most stressful time of year and don't think it should be. All the presents drive me nuts, it's too much. The meaning of the holiday would be more if we would buy less, I think. Hey you made marzipan! How great is that? these are cute cute cute, and I totally agree with little fruit shapes or whatever else floats your boat! Sorry about your mom - man, that still feels like it's pretty sharp. You know, whether a person is into Christmas or not, it is a food and eating time that cannot be equaled. At least here in the northwest we get to wear fleece and bulky sweaters to hide the holiday pounds! Take care! Thank you for admitting your grinchness. I will join that club. Unfortunatly I have to be in the Christmas Cheer for my young kiddos! My I could understand your dislike for the Holidays, if it brings up such painful memories! 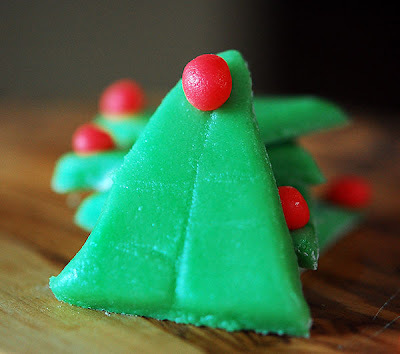 Great job on the marizan candy, being all festive and all... but I'll admit it's kinda my 'childhood green veggie' of desserts. They are just too wicked sweet for me. Look at you all "holiday spirited"! I hear you on the holiday stress. I used to LOVE Christmas when I was a tiny self, but now it's just ok. 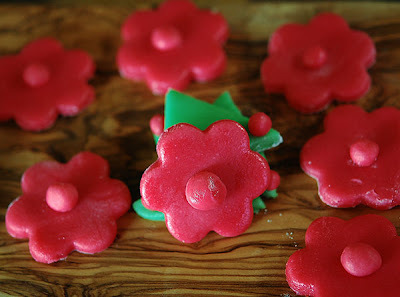 I try to get in the spirit though... but not so much as to make marzipan, lol! Alright, seriously, you are way too funny. I've been cracking up reading through your Twitterstream, and your blogs are just expanded hilarity.